With a known history since the 16th century, cricket originated in south-east England, and soon gained popularity to become the national sport of the country. 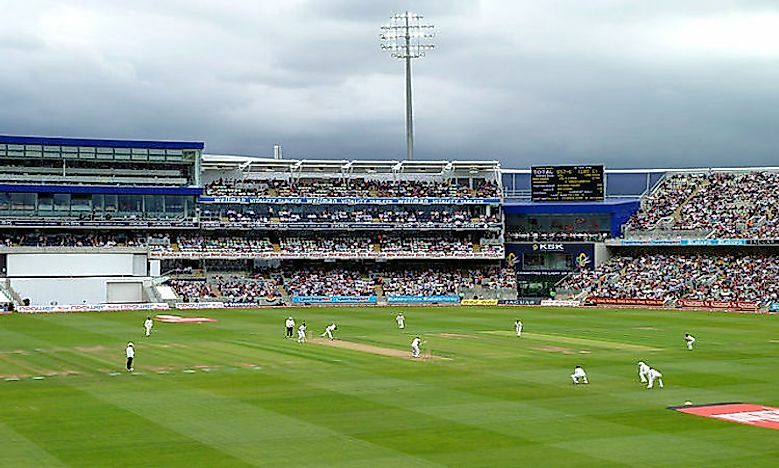 Edgbaston Cricket Ground in Birmingham, one of the most well-known cricket grounds in England and Wales. Sports play a significant role in England. Some of the popular sports in England include football, rugby, cricket, boxing, golf, hockey, netball, badminton, and motorsport among other sports. The country has its national team in most of these sports with the prominence of national teams varying from sports to sports. The sporting activities in England are under the management of Sports England which is also responsible for the distribution of funds and providing strategic guidance. Fours sports in England operate high-profile professional league; football is the favorite sport followed by rugby, cricket, and Tennis. Cricket is a popular sport ranking fourth in England by viewership and contributes significantly to the growth of sports in the country. The origin of cricket in any part of the world is not clear to date. However, the known history of cricket dates back to 16th century in the South-east England. The game became the country’s national sports in the 18th century and had developed globally in the 19th and 20th century. The expert opinion is that cricket was created during Saxon and Norman time by the children who were living in Weald, a dense woodland area in the South-east England which lies across Kent and Sussex. Other speculations about the origin of cricket include the early speculation dated March 10, 1300, concerning King Edward II who was playing creag which was an older word for cricket. However, the experts believe that the word creag was an early spelling for craic which means fun and games. Cricket is believed to have survived for many generations as children’s games before it was taken up by adults in the 17th century. Cricket was played in a sheep-grazed land with the first implements including the matted lump of sheep wool or stones as a ball and a stick or other farm tools as the bat. The first mention of the word cricket dates back to 1587 in a case involving a disputed piece of land in Guildford. In a testimony by John Derrick, he said that his schoolmates had played “creckett” on the disputed site proving that cricket was being played in Surrey as early as 1550. How The Name “Cricket” Was Derived? The word cricket is thought to have been derived from some words. In early publications and references, it was spelled as creckett which might have been coined from a Dutch word krick(-e) which means stick or from an old English word cricc or cryce which means crutch or staff. The French word crique involving a wooden pole is also thought to have been its origin. According to other experts, the word cricket might have had its origin from Middle Dutch phrase for hockey. However, it is highly possible that the word cricket was derived from words used in South-east England which were heavily influenced by the Middle Dutch at the time because of the trade connections with the County of Flander. The cricket game took a real grip of England, especially in the southeastern counties in the second half of the 17th century. The nobles and most of the people withdrew to their counties during the Commonwealth and were heavily involved in the village cricket just as a past-time game. However, the game would spread to London when the Commonwealth expired in 1660. The restoration of the monarch in England was followed by the reopening of theaters and the lifting of sanctions that had been put on sports. Cricket became the leading entertainment since it was ideal for wagars. Cricket was also adopted as one of the main sports by the nobility along with the horse racing and prize fighting. Due to the growing popularity of cricket, the nobility returned to London after Restoration to develop the game bringing with them local experts from the village. London Cricket Club and Mitcham Cricket Club were subsequently formed during this period further influencing the growth of the game.